Paris St-Germain have won a legal challenge that means Uefa cannot re-open an investigation into the French champions' finances up to June 2017. Uefa had initially ruled the accounts complied with financial fair play (FFP) before launching a review. Cas ruled European football's governing body had missed a deadline for its review. However, PSG remain under investigation for their 2017-18 finances. During this season they signed Neymar from Barcelona for a world record £222m euros (£200m) and Kylian Mbappe from Monaco, initially on loan, for 180m euros (£165.7m). Uefa released a statement after the Cas ruling saying it would "analyse" the decision and "consider implementing as soon as possible any clarifications or amendments to its rules that may result from the analysis of the abovementioned award". "The Cas decision does not put in doubt the objectives of the Uefa Club Licensing & Financial Fair Play system," it added. 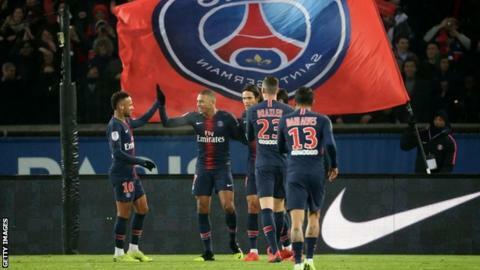 Ligue 1 club PSG were initially cleared of breaking FFP rules in June 2018, but Uefa reopened the case in September. FFP 'break-even' rules require clubs to balance spending with their revenue. A sponsorship deal with the Qatar Tourism Authority was deemed to have an unfair value by Uefa's independent investigation panel. The French club, purchased by Qatar Sports Investments in 2011, were also forced to play with a restricted 21-man squad in European competition for a season.